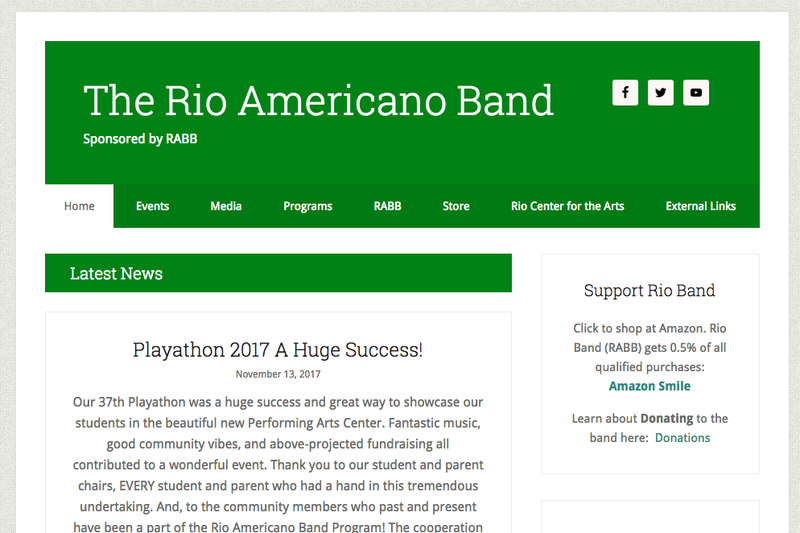 Rio American High School’s Band program asked me to help out with the website for their multi-award winning band program. I had helped out with their site in the past when my daughters attended and before I knew much about WordPress. I offered to fix their urgent issue and look at updating their plugins and set up backups. As I talked to the parent volunteers more, I also agreed with them that the website needed an updated look. The first task was to get automated backups going. I installed UpdraftPlus as usual to send backups to Amazon S3 and cloned the site to a staging server so I could safely test plugin updates and other possibly breaking changes. Quite a few unused plugins were removed, the rest were updated, and I went through a set of tests to make sure the site was still running fine. Then these changes were applied to the live site. Next was the look and feel. They liked the look of another Band’s website and I looked through which Genesis child theme was close and settled on Lifestyle-Pro as a starting point. The theme has very flexible home page areas for future promotion of band events and a nice clean look. I remembered from my past time volunteering that the existing calendar plugin they were using was cumbersome. I switched them to using a shared Google Calendar and feeding that into the Simple Calendar plugin which simply displays a Google Calendar in-place with different formatting options. The final step was updating PHP and MySQL which were both older versions. Deploying to the new site was simply a matter of installing a fresh copy of WordPress next to the current live site. It pointed to a new MySQL database and used newer PHP. Then I could migrate from my staging server to the new site. Once that tested out ok, it just took changing the root index.php to point to the new WordPress install and their new site was live. I’ll be doing some training videos for them and set up processes for how they can promote some of the big events that are coming up in the latter half of their school year. Other than that, though, I’m hands off on the site except for maintenance. They have been very pleased with the cleaner look of the site.